Over the last several decades, the management of partial-onset epilepsy, or focal epilepsy, has changed dramatically, due in large part to the entrance of so many anti-epileptic agents (AEDs) to the market. Earlier this year, the focal epilepsy treatment armamentarium received a new addition with the approval of brivaracetam as an adjunctive therapy in the treatment of partial-onset seizures in patients 16 years of age and older, giving physicians yet another tool in their efforts to offer relief to patients. Ahead, Pavel Klein, MD, Director of the Mid-Atlantic Epilepsy and Sleep Center in Bethesda, MD, and an investigator in the clinical trials for brivaracetam, offers insights on the continually growing treatment choice for focal epilepsy as well as considerations for management. How has thinking evolved when it comes to the understanding and management of focal epilepsy? What are your impressions of the current therapeutic spectrum? What are some of the factors physicians should consider when selecting a regimen? With a wider choice of medications, physicians now have an opportunity to offer patients more customized treatment, the need for which, physicians have learned, has become very clear. 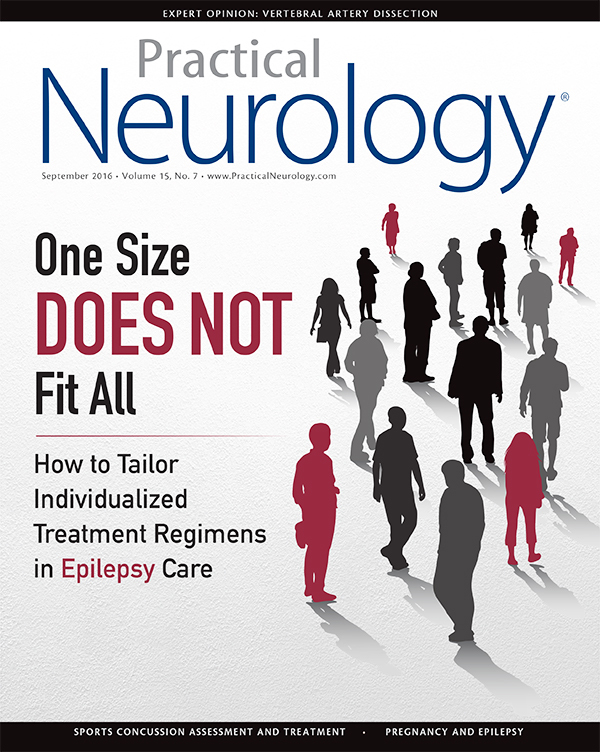 “We have a large number of medications, each with a different side effects profile and potential benefits for some of the comorbidities that go with epilepsy,” Dr. Klein says. Physicians can use these factors as well as the ease of use and speed of titration of a medication to tailor to a particular patient, Dr. Klein advises. “For example, a patient with migraine and epilepsy may well benefit from a medication like valproic acid and topiramate, both which offer potential benefits for migraine and epilepsy, while patients with depression and epilepsy—a common combination—may benefit from valproic acid, lamotrigine, and potentially topiramate,” says Dr. Klein. Physician can also customize their selection to avoid certain side effects. “By and large, most of the newer drugs are not associated with severe side effects, such as potential for bone marrow suppression, liver toxicity, and renal toxicity, but they still may have side effects and you can tailor those to each patient,” Dr. Kelin says. For example, valproic acid may not be a good choice for an overweight diabetic patient because it may exacerbate weight gain and hyperinsulinemia and make diabetes harder to control. By the same token, Dr. Klein says, “That same patient may benefit from topiramate, which may cause weight loss and be potentially beneficial for diabetes.” Physicians can also customize regimens based on a patient’s needs, such as prescribing oxcarbazepine, eslicarbazepine, levetiracetam, lacosamide, or the recently approved brivaracetam for a patient who needs rapid initiation of treatment, since they are both easy and fast to titrate. How does the newest agent, brivaracetam, fit within the current spectrums of AEDs? “Brivaracetam is a small molecule with a similar mechanism of action as levetiracetam. It was designed to have stronger binding to the molecule which is thought to mediate the antiepileptic action of levetiracetam, the synaptic vesicle protein 2A. SV2A modulates the release of neurotransmitter from a neuron into the synapse. Brivaracetam has about a 15- to 20-fold greater affinity of binding to SV2A than levetiracetam. In animal models of epilepsy it is more potent than levetiracetam,” says Dr. Klein. “In Phase 3 studies, brivaracetam significantly reduced the frequency of seizures over placebo and had a benign safety profile.” It was also well tolerated, with a low rate of discontinuation due to adverse events; five to eight percent of patients stopped brivaracetam because of side effects in the pivotal Phase 3 studies compared to four percent of placebo-treated patients. “The main side effects were somnolence dizziness, and fatigue, and most were mild to moderate. Severe side effects were infrequent,” he says. “In addition, the psychiatric side effect profile appears to be benign, with the most common effects being irritability (three percent compared to one percent with placebo), anxiety and insomnia (also three percent, compared to one to 1.5 percent with placebo), and depression (two percent, compared to one percent with placebo).” Moreover, the drug appears to have no major interactions with other agents. One potential advantage of treatment with brivaracetam is that in clinical studies it was evaluated without titration and it penetrates the brain quickly. “In the phase 3 trials, investigators started treatment with the target dose from day one, which is a great advantage if you want to get patients under control quickly,” notes Dr. Klein. “It’s also easier for patients if you have a simple way of initiating medication.” Adding to the ease of use for patients is that it is available in intravenous as well as oral form, notes Dr. Klein. “With good efficacy, a strong side effect profile, and ease of use, brivaracetam is a good addition to the treatment armamentarium of anti-epileptic medications for patients with partial seizures. Given recent changes to the epilepsy treatment spectrum, what do you expect in the years to come?